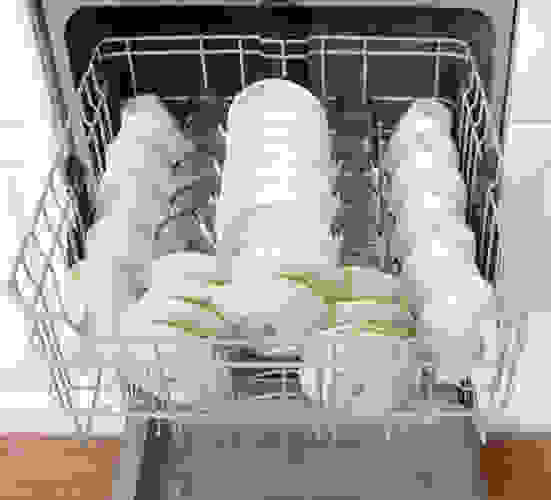 A simple, run-of-the-mill dishwasher that's cheap to buy and cheap to run. This review was published on May 14, 2013. Since then, this product may have been discontinued or replaced. Pricing and availability may differ from what is stated in the review. 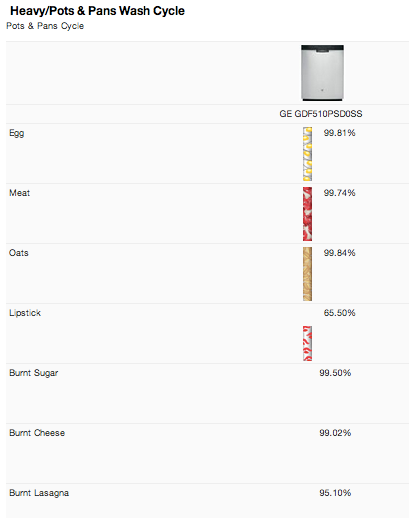 As run-of-the-mill as it gets for a dishwasher, the GE GDF510PSDSS rings the bell-shaped curve. You won’t find any fancy jet pro power scrub sprays, hair-trigger soil sensors, or nuclear desert-blaster heated dry here. 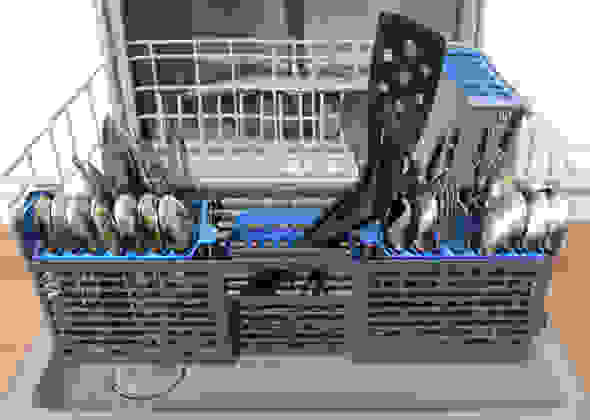 What you will find is a simple dishwasher that features only the cycles and options you need to get your dishes clean. The combination of limited options, average performance, and unexciting design can make the GDF510PSDSS seem utterly boring. However, we did find through testing that it has a pretty low average annual operating cost. I don't know about you, but I'd rather my dishwasher save me money than keep me entertained. With an MSRP of $549, and sale prices closer to $450, this GE isn't a bad option if simplicity is just what you’re looking for. Not much excitement except for a quirky control panel. For some people, the cheap look alone is a dealbreaker. The GDF510PSDSS features a stainless steel door topped by a front-facing control panel made of black plastic. Once you open the door, everything you see is gray plastic: the walls, the racks, the wash arms, and the cutlery holders. Plastic walls tend to lead to noisier washes and less effective drying, but for some people, the cheap look alone is a dealbreaker. GE makes a "hybrid" version of the GDF510PSDSS called the GDF540HSDSS that's nearly identical, except a part of the interior is stainless. The GDF540HSDSS costs $50 more than the GDF510PSDSS. The control panel gets special mention. On the upside, the buttons are textured, and click audibly when pressed. However, instead of having a different button for selecting each cycle, the GDF510PSDSS requires that you toggle through each cycle with a single button. This is a minor inconvenience; a dial, knob, or individual buttons would make more sense here. Our main control gripe, though, is that some of the buttons do different things depending on how long you hold them down. As an example, the Start button starts a cycle, but also cancels a running cycle if you hold it down for three seconds. However, the button to turn on the Heated Dry option also locks down the controls if you hold it for three seconds. The former makes some intuitive sense, as starting and canceling a cycle are related. 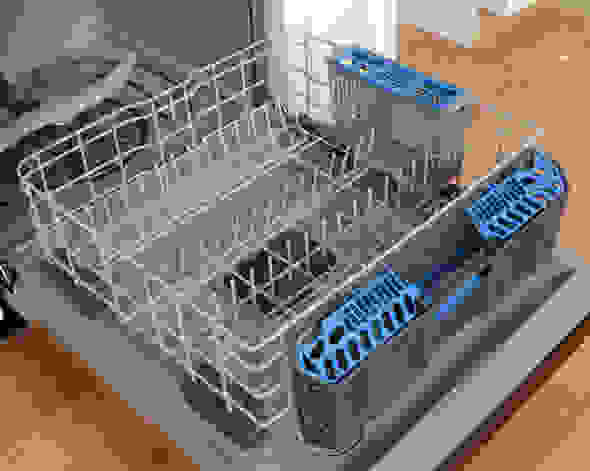 Drying your dishes after the wash and locking out all control inputs? Not so much. Not one, but two cutlery holders come with the GE GDF510PSDSS. In addition to a larger, front-mounted, detachable cutlery holder on the bottom rack, there’s a separate, smaller one for serving utensils. 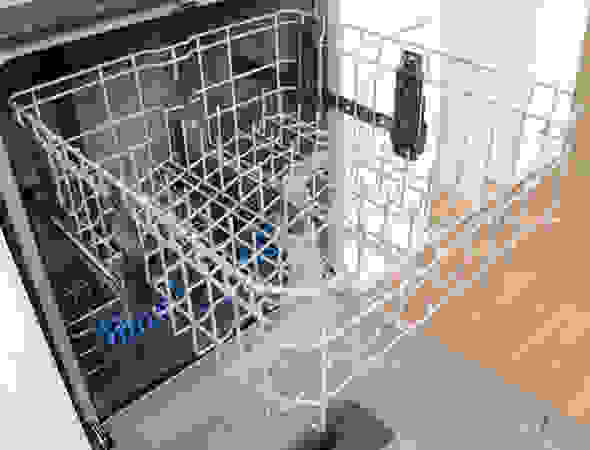 For our testing purposes, we removed the second basket entirely, but it is an option that adds a great deal of flexibility for people who need it. You can also fit the full-sized basket on the right side of the bottom rack instead of hanging it off the front. Unfortunately, your flexibility ends there, as none of the racks feature any collapsible tines or other adjustable parts. A bare-bones package of wash cycles and options. 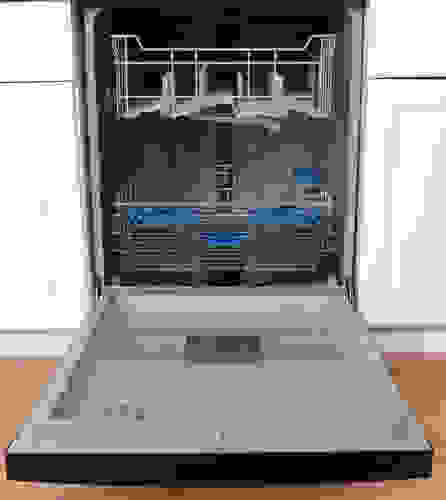 The GE GDF510PSDSS’s wash cycles are Normal, Heavy, and Light, with a Rinse cycle for lighter jobs that don’t need detergent. There is no Quick wash cycle on this machine, but the Normal is pretty fast, clocking in at a little under 1.5 hours. It should be noted, however, that this does not include a drying cycle. In most of the other machines we’ve tested, the heat dry option is chosen by default on Normal and Heavy cycles. Not so with the GDF510PSDSS. 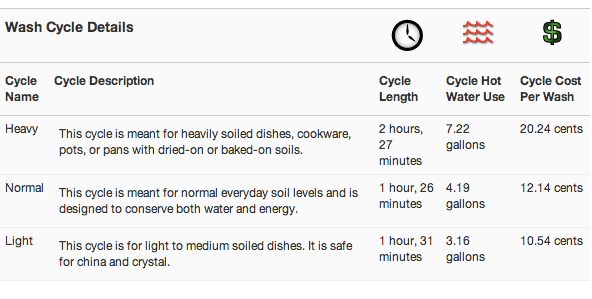 If you want to have the convenience of dry dishes at the end of a cycle and have the extra time to spare, be sure to select this option. For tougher jobs that the Heavy cycle can’t handle, turning on the Wash Temp Boost to increase the wash temperature may do the trick. Finally, there’s a control lock to prevent accidental button presses. Decent at cleaning dishes, but especially efficient and fast. While the results were far from dismal, they weren't perfect. The GDF510PSDSS failed to excite us with its cleaning ability. While the results were not dismal, they were also far from perfect. The classic problem of redeposit was present, with spinach, oatmeal, and in the Heavy cycle, burnt sugar particles having spread to other dishes after they’ve been otherwise cleaned. This problem, sadly, is not uncommon among dishwashers that share the GDF510PSDSS’s price range. Even without the redeposit, small amounts of meat, milk, oatmeal, and egg would still got left behind, though these amounts were very minimal. The GDF510PSDSS enjoyed some very fast wash cycle times, but with a caveat; no drying cycles were included. As mentioned earlier, the heat dry option is not a default setting for any of the cycles on the GDF510PSDSS. 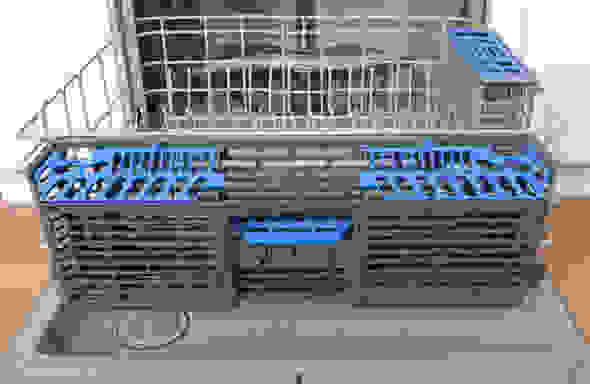 Drying cycles last usually in the range of 30 to 40 minutes, and if added to this dishwasher’s wash cycle times, the total amount of time taken is, unsurprisingly, about average. But there is an upside. The faster cycles minus electric heating and the lack of a “Quick Wash” option, which tends to use a large amount of water to get a quicker clean, help drive down the GDF510PSDSS’s annual operating cost to just under $30. Unassuming, efficient, and effective. That's what a dishwasher should be. The worst thing about the GDF510PSDSS is its utter lack of outstanding features. That's also the best thing about it. 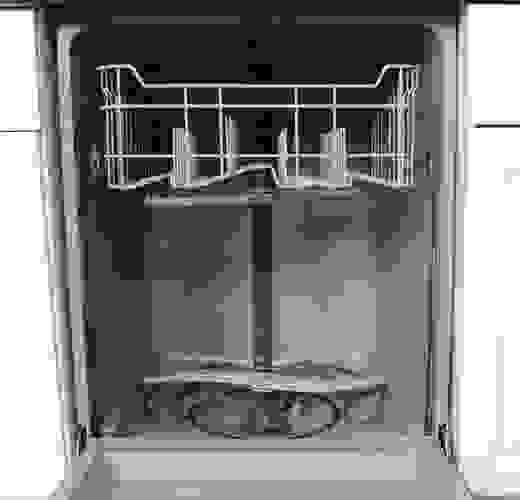 This dishwasher can either be seen as beautiful in its simplicity, or completely forgettable in its unobtrusiveness. Given its low upfront cost and low annual cost, it offers a good value. 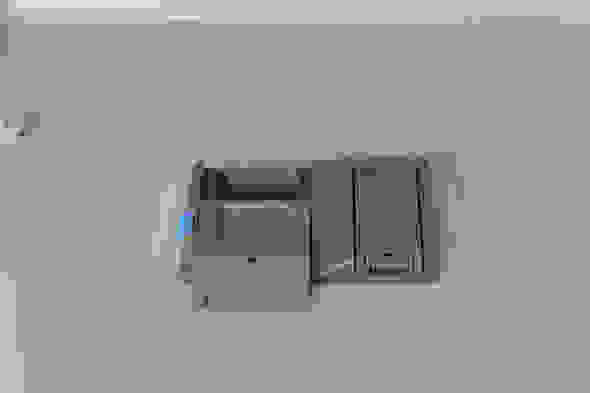 However, if you are looking to spend $50-100 more for slightly better cleaning and a ton more customizability, other models such as the Frigidaire FGHD2465NF may be a better fit for your kitchen. Front of the GE GDF510PSDSS with the door open. Interior shot of the GE GDF510PSDSS. The GE GDF510PSDSS's detachable filter. 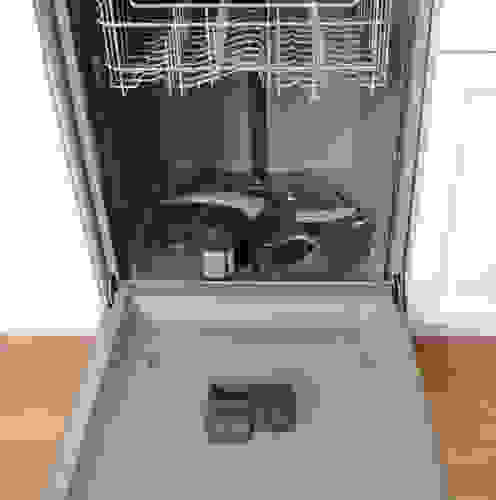 The GE GDF510PSDSS's detergent dispenser. The GE GDF510PSDSS's three wash arms. The GE GDF510PSDSS's bottom rack. 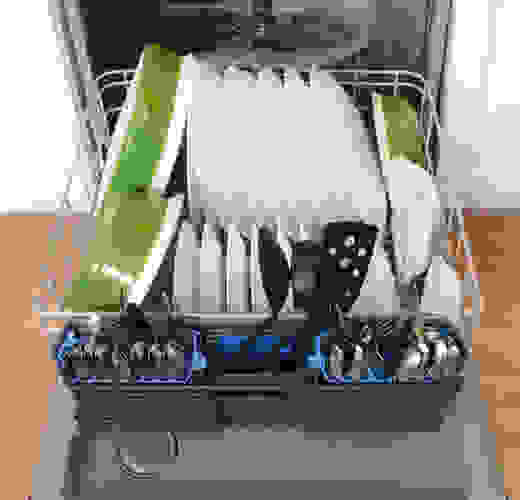 The GE GDF510PSDSS's cutlery basket. Left side of the GE GDF510PSDSS's control panel. 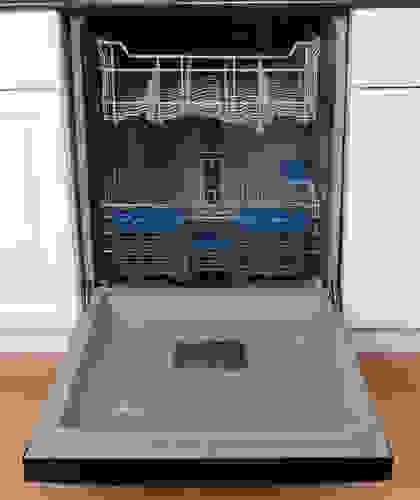 The GE GDF510PSDSS's top rack. Right side of the GE GDF510PSDSS's control panel.